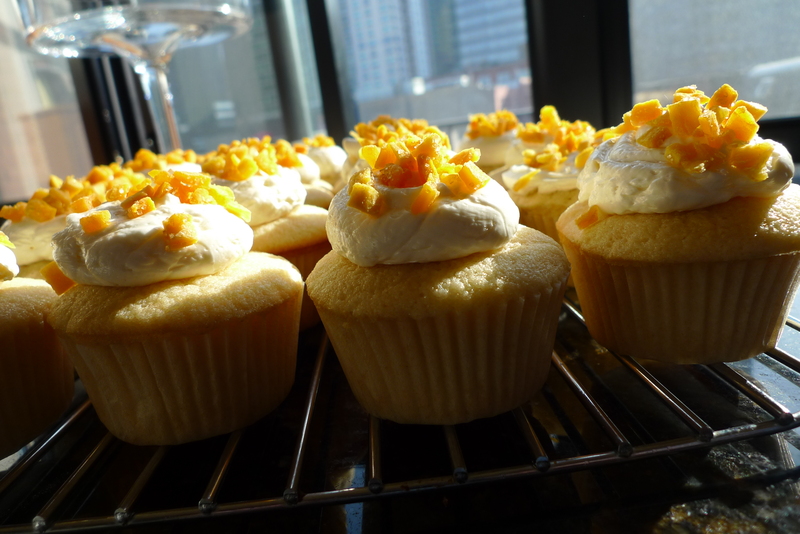 I was taken on a mini vacation courtesy of Coconut Cupcakes with Candied Mango. I’d really like to go back and all I need to do is whip up another batch. No bathing suit required; in fact, its frowned upon. The batter is light and fluffy and the frosting follows suit. 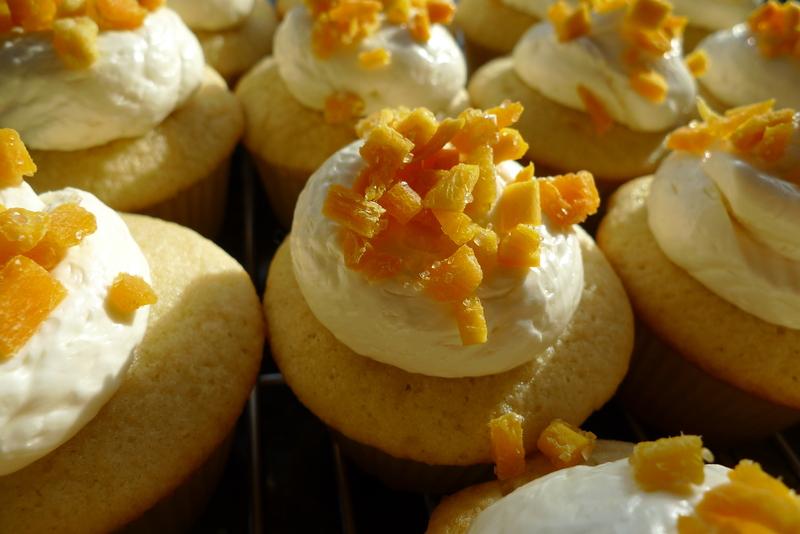 Candied mango is something better than the icing on the cake. It is a little tropical boost on days when it’s not quite spring and it’s definitely not summer. Preheat oven to 350 degrees. 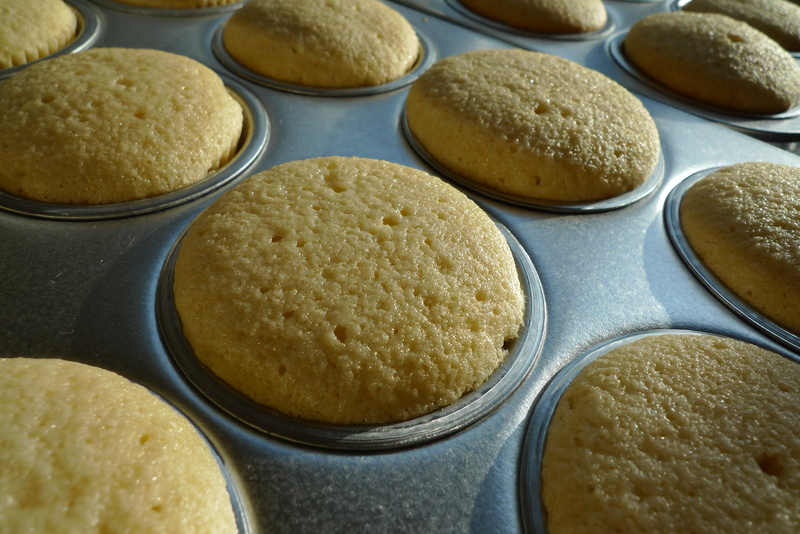 Line 2 (1/2 cup-12 capacity) muffin tins with cupcake papers. In a small bowl, combine the flours and set aside. In a large bowl, cream the butter until smooth. Add the sugar and beat until light and fluffy. Add the eggs, one at a time, and beat well after each addition. Mix in vanilla. Add 1/3 of the dry ingredients, followed by 1/3 of the milk. Repeat process twice, without over beating mixture. You just want the ingredients incorporated. Scrape down the batter in the bowl and make sure batter is blended. 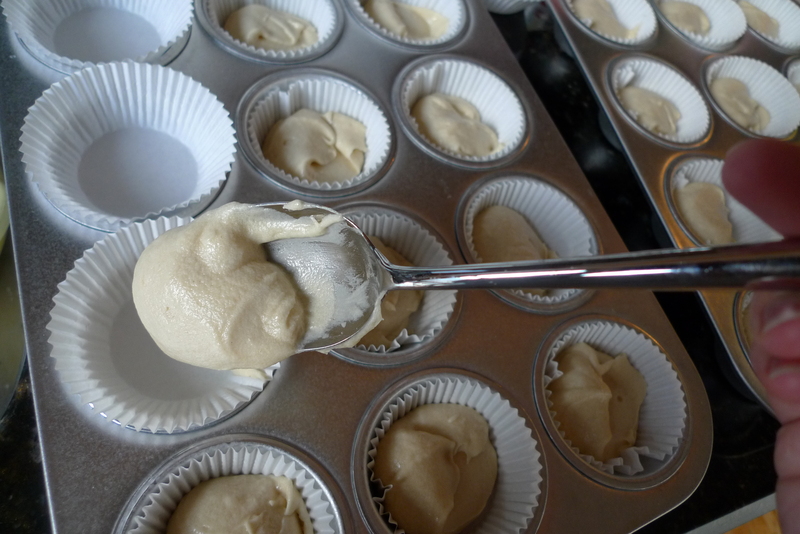 Using an ice cream scoop or a small ladle, spoon the batter into cupcake liners, to about 3/4 full. Bake for 20 to 25 minutes, until a cake tester comes out clean. 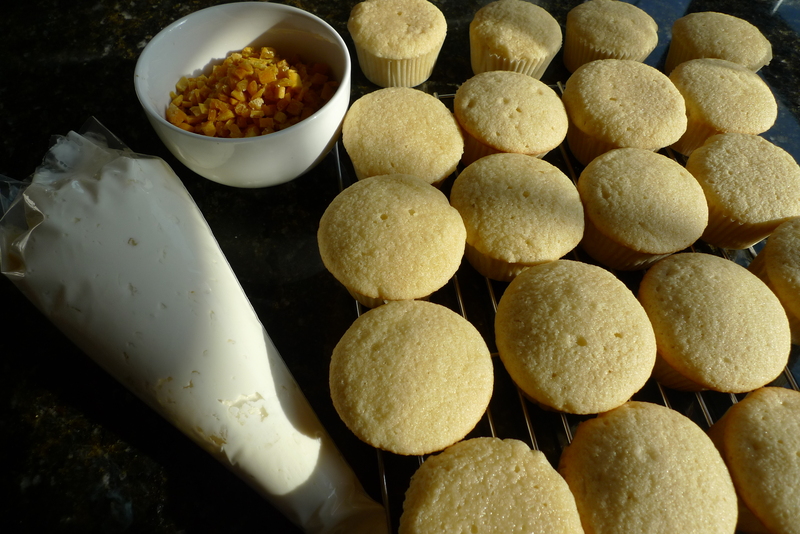 Cool the cupcakes in tins for 10 minutes. Remove the cupcakes and cool completely on a wire rack. For the Buttercream Frosting: Combine whites, sugar, and salt in bowl of standing mixer. Set the bowl over a saucepan of barely simmering water (about 1 1/2 inches deep). Whisk until mixture is opaque and warm to the touch. It should register between 120-130 degrees on a candy thermometer, about 2 minutes. Using a potholder, transfer the bowl to the mixer stand. Fix whisk attachment and beat mixture on high speed until whites are glossy and sticky, about 8 minutes. Meanwhile, cut each stick of butter into 6 pieces. Reduce speed to medium-high and beat in butter 1 piece at a time. If mixture is curdling a little, don’t worry. It will be fine once you add the next ingredients. Add cream of coconut/sweetened condensed milk and coconut and vanilla extracts. Stop mixer to scrape down sides. Continue to beat at medium-high speed until frosting is fluffy, about 1 minute. Put your pastry bag (fitted with any tip you like, or do what I did and cut a hole after you fill it) into a tall glass and fold top over the sides of the glass. This is so you can put the frosting in without also holding the bag. Fill bag with frosting and tie top. You can also spread frosting on the cupcakes with a knife or frosting spatula. For the candied mango: combine diced dried mango with 2 tablespoons raw sugar in a plastic bag. Make sure mango pieces are coated with sugar crystals. 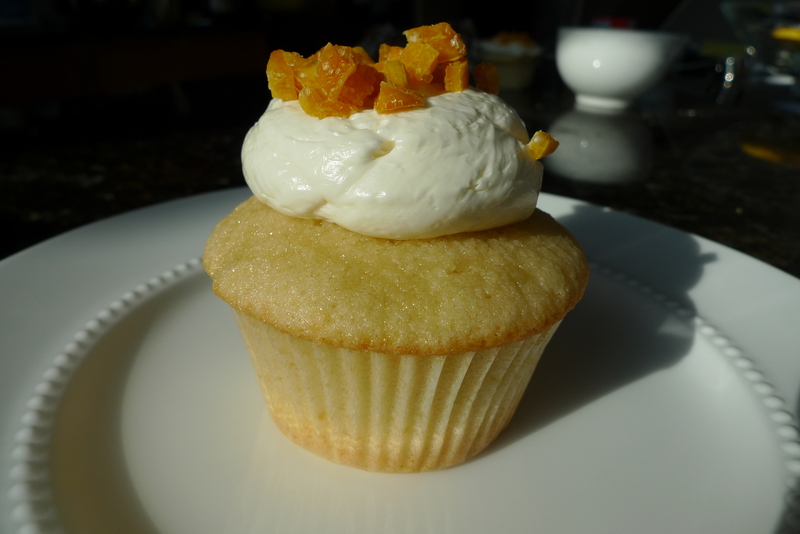 Pipe frosting onto cupcakes and sprinkle with the candied mango. Enjoy! I was taken on a mini vacation courtesy of these Coconut Cupcakes. I’d really like to go back there, and all I need to do is whip up another batch. No bathing suit required, in fact, its frowned upon. Holy cow, thank you so much for posting this! It is going to help when I research Coconut Milk at the grocery store! Beautiful!